What a Privilege it is to be a Tax Payer! We are smack in the middle of our winter, wood firing program, we have done 9 weekends in a row and still have quite a few to go. 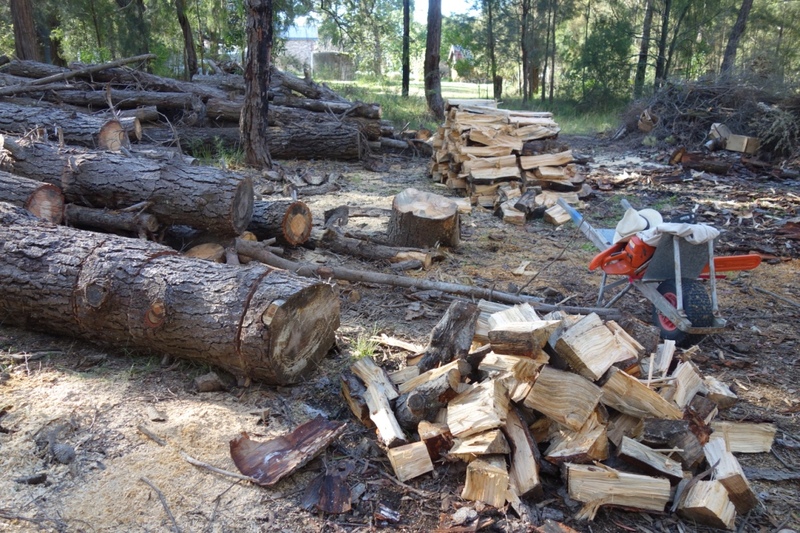 I am spending a lot of time cutting, splitting and stacking wood for each firing. It takes about a tonne of wood to fire the kiln for the 20 or so hours for the kind of quick firing that we do here for these workshops. I get out early and spend a few hours cutting the logs to length to suit the firebox length that I need for this kiln. 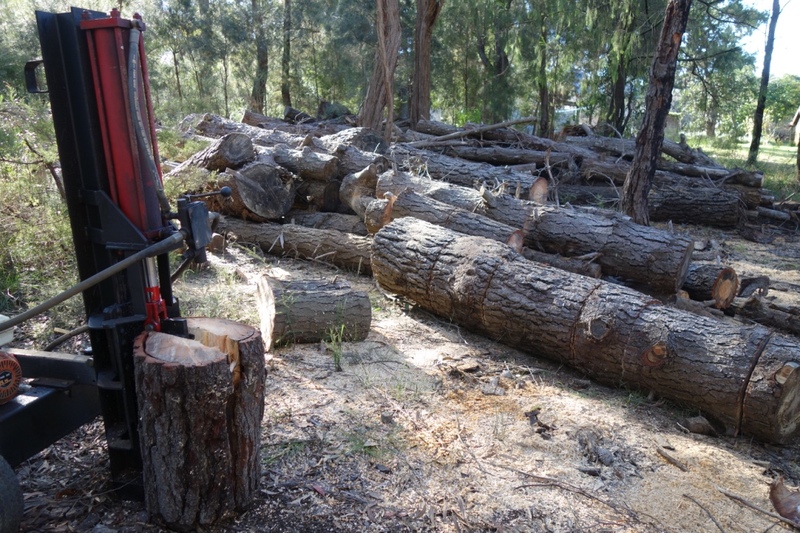 I spend the next 4 or 5 hours splitting the logs that I have cut. I was busy in the morning with other jobs, so I am a bit late getting started into this job. Still, it has to be done, so I get stuck in. It’s a bit foggy and misty/rainy, but once I get into it and warm up. I don’t notice the rain at all. 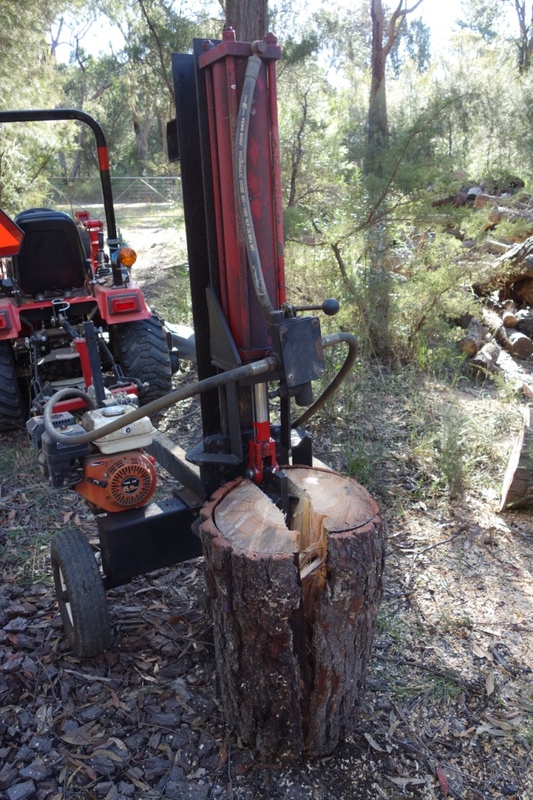 Splitting wood is a bit mind numbingly repetitive and ever so dull, but what can you do?. After a few hours, I’m a bit over it. But there isn’t enough split yet, so on I go. It’s getting late and a bit dark now, but I push on when I shouldn’t, but I think that I need to do more. Its stupid, but on I go into the dark. 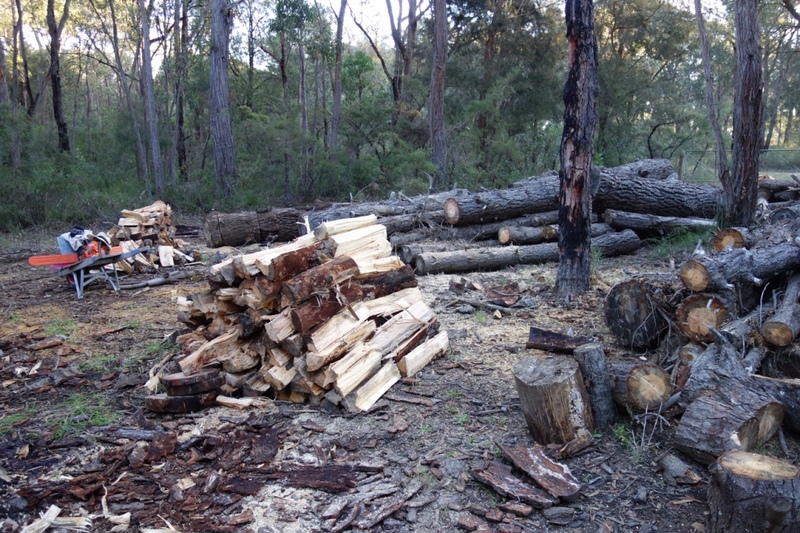 The pile of logs is getting smaller on the fire-wood pile of split pieces is getting wider and taller. Suddenly it happens. I’m way too tired and should have stopped an hour ago. I catch my finger under a piece of wood in the splitter. Immediately, I stop the downward motion of the blade, but its too late. The pain explodes like a cracker in my mind. There is a flash-light like burst, but not towards me, it’s from the inside my head outward. My vision isn’t affected like it would be with a camera flash. There is no burnt-out hole in my vision. Instead, there is a ringing, although strangely silent sound, with a flashing stab of pain. Somehow, a piece of wood, that I had in a tight grip in my hand, has somehow slipped, or been wrenched, from my grip. It flips around and over, twisting my wrist and then comes down hard on my other hand that was supposed to be holding the log secure! How could this happen? I can’t even imagine that this is possible. The pain is blinding and a little nauseous. I can’t even understand what has happened, I’m stunned, but I know that it is serious. I am sufficiently aware to know that I should shut down the motor of the splitter before heading to the house to wash my hand and have a good look at my finger in the bright-light of the kitchen. Luckily, on this occasion, here is no broken skin, no blood, but my finger is still numb to this day. Some sort of damage that I hope will eventually repair itself and grow out. I remember an earlier event of a few years ago, when I really did do myself some serious damage with the splitter. That time I caught my finger under the edge of the blade and it was dragged in and under by the protective glove. I try to pull back on my hand, but the machine is stronger and the glove is caught in the blade. The pain is so intense that I can’t describe it. I’m blank. There is no real memory of it at all. It’s all gone into the file marked ‘don’t go there’. I can remember that it all happened so slowly. I could see it all happening in slow-mo. It all took seconds to happen in replay, but over so quickly. I’ve crushed my finger. There is no doubt. I gasp it in a vice-like grip with my other hand. I am suddenly in shock, but I can still remember that I had the presence of mind to stop the machine, kill the motor, and take the keys out of the tractor, before heading for the house. I usually wrap everything up in a tarp to keep it all dry in case of heavy dew or rain, but this is different and I just walk away. I know that it is too serious to be bothered with the trivialities. I can’t get my glove off. It’s wet through and stuck to me. I can’t bear the thought of shaking it off or pulling it off. A piece of my finger might comer with it!. Is it wet with blood or sweat? I don’t remember it being wet beforehand. I’m gripping my hand so tightly, that I’m cauterising it. I don’t mean too. I can’t help myself. It’s instinctive. I head for the house. I walk in and Janine knows straight away. She grasps her mouth. “What have you done now”! I often come up to the house with some sort of blood stained head or hand that isn’t any sort of real problem. When you are focussed, and want to get the job done, you just push on and get it finished and don’t let any little nick or scratch deter you. I say “What blood?” and we go from there. It’s always so superficial. Boring even! But this is different. I know, that she knows, that I know, that I’m hurt. I haven’t cried since I was a child, but this makes my eyes water a little. I’m far too quiet too. She knows. She goes to get the car keys. We’re off to the hospital. I ease the glove off over the sink. It isn’t blood that is sticking it on, but sweat. It’s crushed out of shape a bit and the numbness is starting to wear off now and it’s hurting like hell. She drives and I sit and shiver. I’m feeling quite cold now, while only a few minutes ago, I was hot and sweaty and very busy. I want a drink of water, I’m parched, but The Lovely say no! “You’re in shock and it’s not good to drink anything, just in case you need surgery and anaesthetic. So I sit and shiver it out for the 25 minutes it takes to get us to Bowral Hospital Emergency. The triage nurse see us coming through the outer doors and comes out from behind her desk to meet us. She ushers us straight through a side door and into some sort of cubicle. So much for all those poor people queued up in the rows of seats in the waiting room! She says to sit here and someone will come. They do. I must look bad, to get this Ryan-Air style priority seating. The nurse comes and asks me some questions that I don’t remember. Janine isn’t here now, she’s back outside. I’m cold and alone. Eventually the Doctor comes. He looks at it and asks how I did it. He flinches! He tells me that I’m stupid! I already know that. You’ve spent 10 years becoming a doctor. Tell me something that I don’t know! I am lucky. I know it, and I am very stupid with it. I know that too! I should have stopped an hour earlier. But didn’t. I am so fortunate. However, I’m also aware that if I had lived my life, stopping when I should, and not working extra time, doing over-time and more! Doing too much. working into the dark. Not stopping for beak times and working to rule, then I wouldn’t own my own home by now. You have to put your arse into gear and work hard if you want to get ahead in this Brave New World of part-time, unregulated, contract work and self employment. The doctor starts to clean the wound and gives me a series of injections around the site. A local anaesthetic. But it doesn’t work very well and I can still feel the needle go in and out, and be pulled through, with each stitch. It hurts! I ask if this is normal and he answers that there are some places that are very hard to anaesthetise fully and this is one of them. He gives me a few more shots and it is a bit better, but still quite sensitive to the needle and thread. More of a sort of prickly sting, than a real pain. I’m not about to complain. I’ve seen the third world, I consider myself so lucky that this has happened here. Eventually, it is all cobbled back together. X-rays reveal that no bones are broken, but a lot of damage has been done to the knuckle. He warns me that it will take a while to heal and that I should go and see my regular doctor on Monday. I get a script for antibiotics and pain-killers. It doesn’t look quite normal any more, but at least I still have it. It ends up taking over a year to loose sensitivity and another year to get back to normal function. To this day, if I bump it during the winter when it is cold. It stings and aches for ages. I’m a very lucky man and I know it. But this is the price of independence in the Brave New Deregulated World. At least the hospital is clean, the service is fast, excellent and sterile. I’m not in the third world now!. It’s also completely free. I’m amazed. I should pay something. If I went to a doctor, if one was available on a Saturday night. I’d have to pay him or her. I am so very grateful that such an amazing service is available. I want to pay someone for this incredible service. But No, I can’t, it’s totally free to citizens. This mind blowingly complex and efficient service is apparently covered by my meagre taxes.